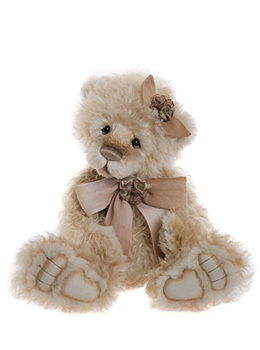 Charlie Bears Arabella Discounts Apply ! Hi all I am Arabella. I am made from a mix of Peach and White luxurious alpaca and thick curly mohair, Just look how cute I am . I have Hand Stitched Nose and sculpted paws with a super large Satin Bow Matching the One in My Hair with rose Fastening . Her Best Mate Is Millicent.